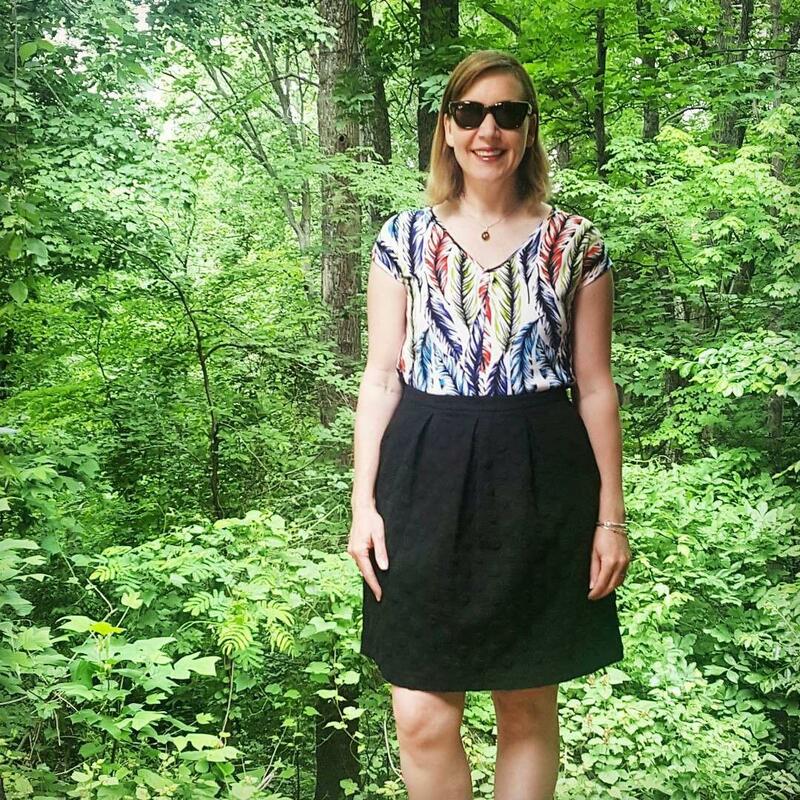 Fabric Mart Fabricistas: Skirt Challenge: Selene for Travel! I wore this outfit on Friday to school, to give the skirt a test run before my trip! 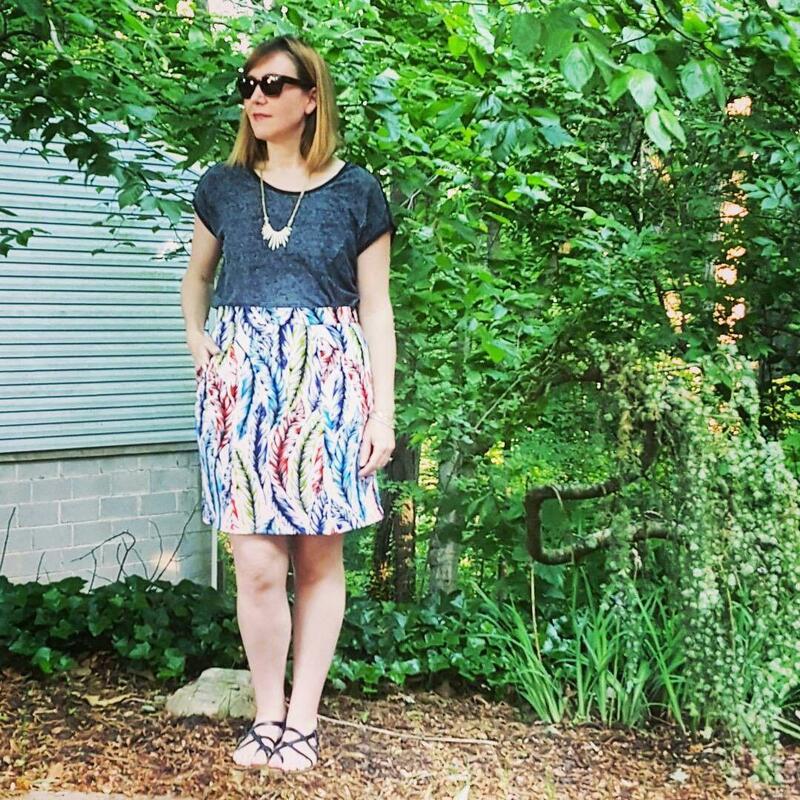 When Fabric Mart announced they were hosting a skirt challenge for May, and asked if I would participate, I jumped in with both feet immediately. During the school year I prefer to keep my makes to once every two months, but I couldn't say no! I am heading to California in a week to spend time with some relatives, and I figured making a skirt and top from a double knit printed fabric (they sold out of this pretty feather printed version) would be an excellent choice. I told Fabric Mart I loved the idea of wearing the two pieces together so they looked like a dress, and I also loved the fact that the skirt could pair well with multiple tops in my closet, and the top would also pair with many bottoms. This means I can pack less for my journey out west! The Selene from Colette Patterns was my first choice for its classic shape (a straight skirt that I could modify to fit my smaller waist and larger hips). The fact that it had pockets not in the side seam were especially appealing. I chose version C which features a pocket made from a yoke feature near the waistband. The skirt also has princess seams with a center panel. This makes fitting very easy, and now that I know this skirt is a bit loose in a double knit, I can definitely use this size for any future makes in a non-stretch woven. I love the look of version A's welt pockets, but to be honest, this yoke style is a lot easier to construct, so I'll probably stick with C in any future makes. 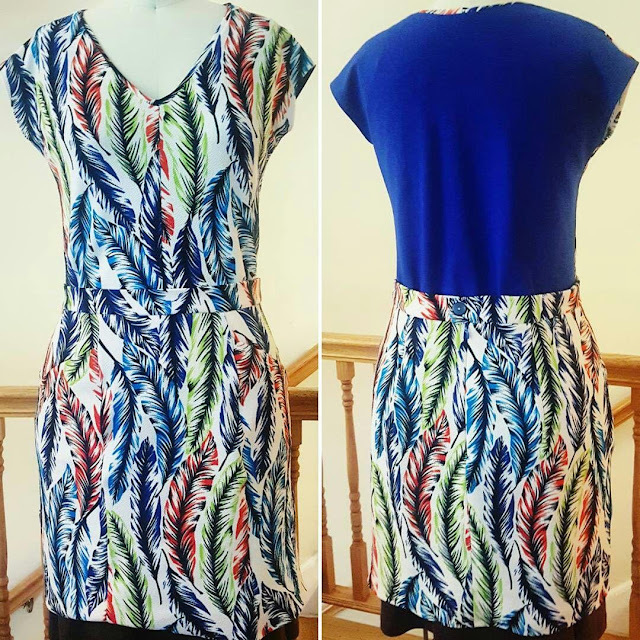 The C version has a clipped V detail on the pocket, but I didn't want that for this skirt simply because the detail would have been completely lost in this fabric. 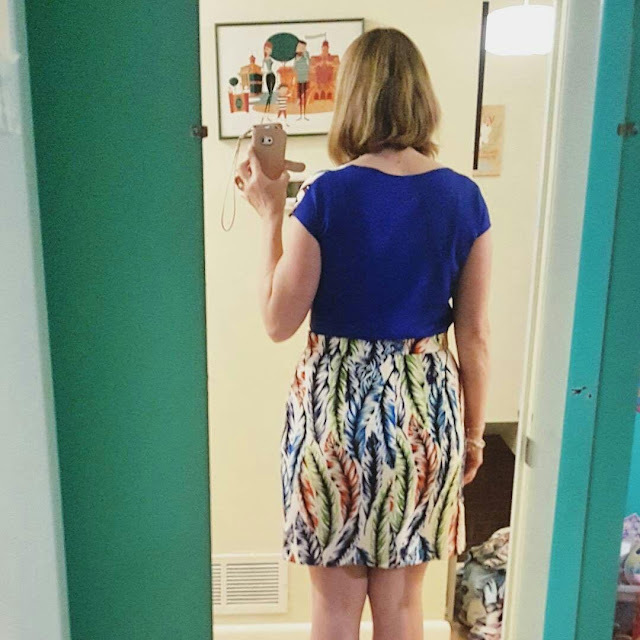 I rarely like the way I look in skirts from the back, but this one's very large darts*, combined with my grading the seams from a size 8 at the waist to a 12 at the hips and hem means that it works with my shape. I definitely want to make this one again since this one works for my lower half so nicely. I do believe the 8 waist is a touch big, but I won't know for certain until I try the same pattern sizing in a woven without stretch. I added interfacing to the waistband so the double knit wouldn't stretch, but I do feel like the stretchy fabric might mean there is an ease there that wouldn't be so apparent with a non-stretch fabric. *One thing I did NOT like about the Colette pattern was the way the sizes were printed on the paper. It is all one color and with many sizes, I found it very difficult to follow my size line. I used a size 8 dart, and it had the same printed line as two other lines on the pattern paper, which meant that I initially started tracing the size 20 (I think) line and not the size 8. I then said, "oh, there's my line," and traced the size 2. Ugh. Finally I found the 8, thank goodness. But I really do think different colors might help differentiate the sizes better. I know it's more expensive to print in color, but if the patterns are that expensive AND with that many sizes, it seems to be the only logical choice. I didn't add any length, and it seems fine, though I may want to add an inch for something a bit more modest/formal. The skirt is lined in stretch nylon tricot, but I decided to use the original skirt pattern pieces (with the exception of the side front, I used the lining ones for that). 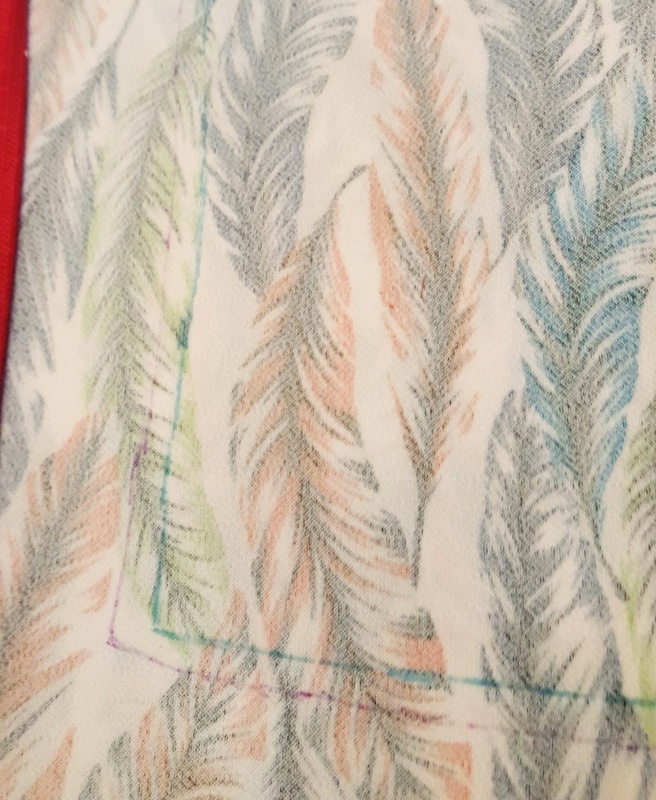 The lining patterns end something like ten inches ABOVE where the regular pattern pieces do. Ugh. I am very sensitive to fabric changes in a garment, and I know I would be really bothered if the lining was that short, and I know I would feel the lining in half the skirt but not the other half. I did shorten the lining, though, a bit, to account for the hemming of the skirt (I didn't hem the nylon tricot, it doesn't fray, so really not a huge priority of mine). I decided to use the size 2 length on the lining, whereas I used the size 12 length on the main portion of the skirt. I'll wear it together in California! 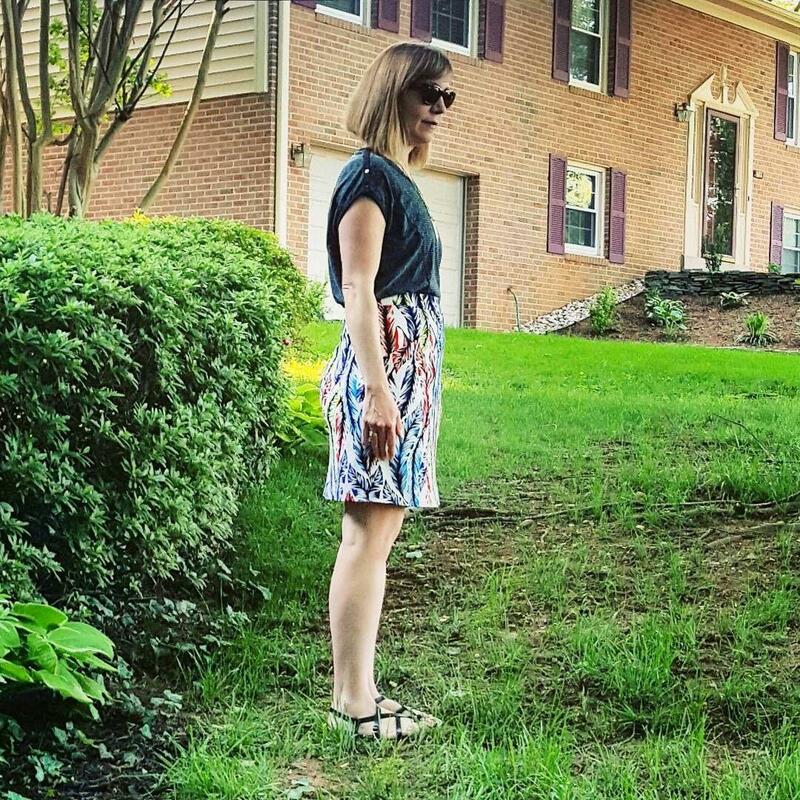 Here is the skirt with the matching top. As you can see, it does really look like a dress. With the tee, it takes on a casual look, but with the sleeved top, it seems a bit more formal, which is what I'll need as one of my engagements in California are my cousins' confirmations! Sad change happened to this top from conception to creation, though looking at it from this photo, I am digging the change, since the contrast of the dark blue looks really nice with the skirt's pattern. I had originally intended for the top to be completely made from the feather print double knit, and had cut out both pieces from it, but somehow, SOMEWHERE in my blasted house, is the front part of this top. Gah. I blame my children, whose adorable little hands probably put it somewhere. 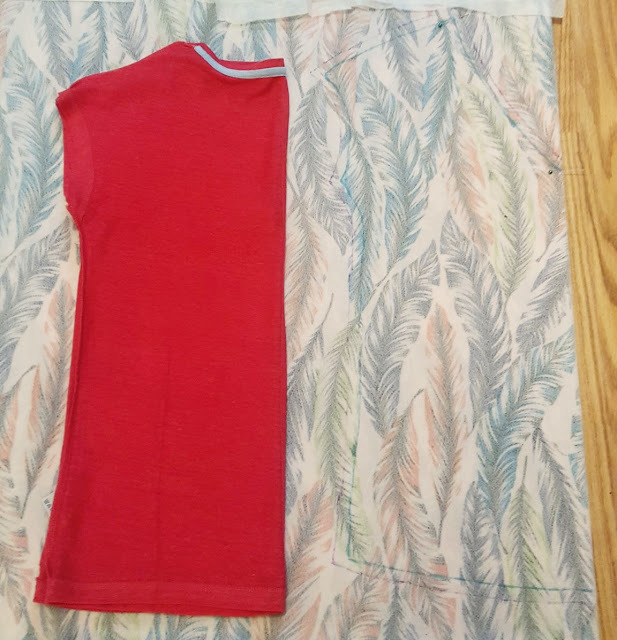 So I had to take the back piece I had cut out and cut out a new back piece from another fabric that matched (this is a gorgeous rayon/nylon/lycra ponte I received from Fabric Mart in a bundle). Then I had to re-cut the front from the original back piece. Sigh. Here is my "pattern" for the top. LOL. I recently purchased a very nicely fitting v-neck linen tee from Boden, and it looked like the world's simplest design, so I figured I could do the old "lay the tee in half and trace around it" trick. It worked, and the top really does have a similar fit and feel to the linen one (though the ponte makes it a bit more structured). I added a 3/8 inch seam by using my (very handy) seam ruler. I highly recommend one of these if you ever plan to draft your own patterns, or if you use some of the European magazines (like Ottobre or Burda) where the seam allowances are not included. Here are some detail shots of the pieces...on the left side, top to bottom, I've shown the neckline detail of the top, the button detail of the back waistband (the Selene calls for a lapped zip and a hook closure--I went invisible zip and a button instead), and the pocket of the Selene. 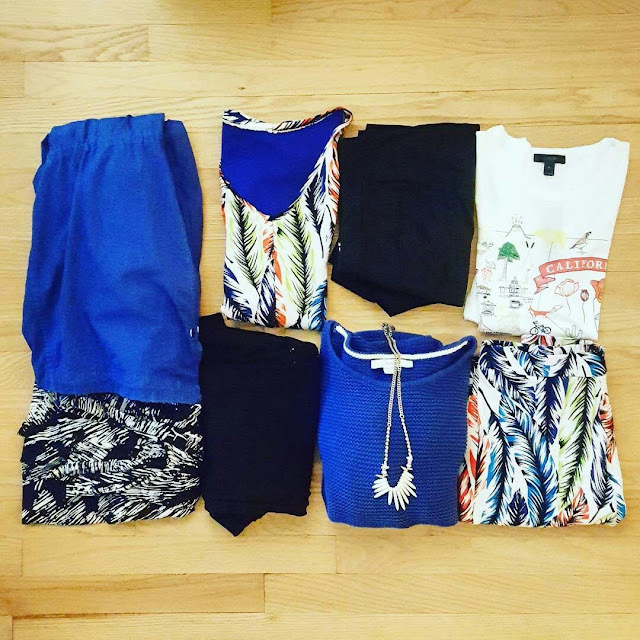 Left to Right, Top to Bottom: Coat, Top, Shorts, Tee, Dress, Pants, Sweater, and Skirt. Here is my packing for the trip. It is central coast California, so I have to add a light jacket and a sweater (cold cold nights!). I also am including a pair of black pants for travel, a pair of shorts, and a tee. I will wear the sandals (not photographed) for the more casual outings, but will wear the closed toe shoes (not photographed) for travel and at the Confirmation. This is how I wore the top with a skirt to church yesterday. I love both pieces so much. 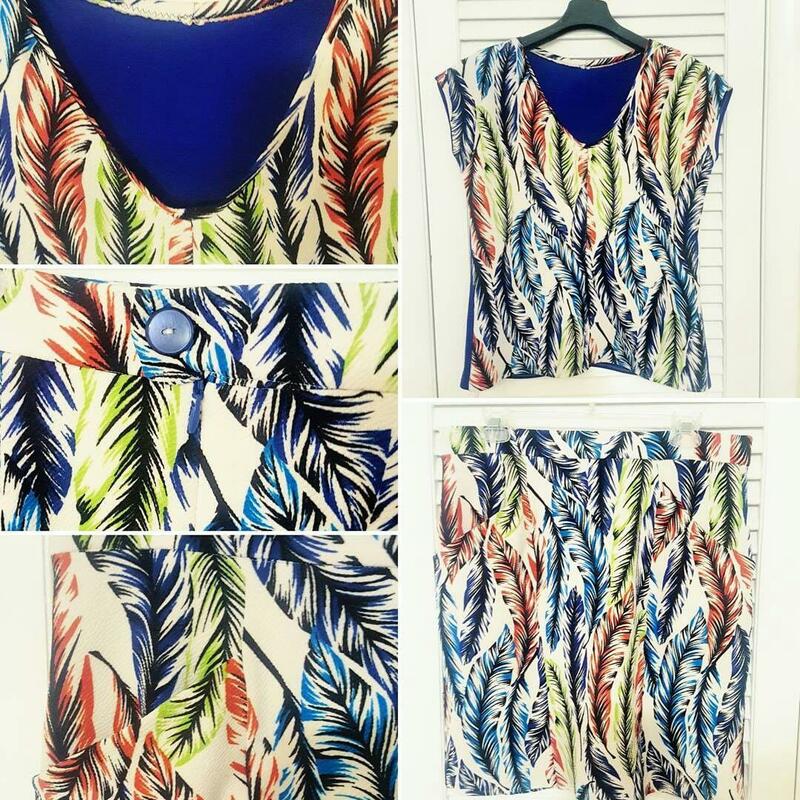 I am so excited to have two nicely fitted, travel-friendly pieces to bring with me to California next week. Okay, that's it for a bit. I hope you all are experimenting with your skirts this month! 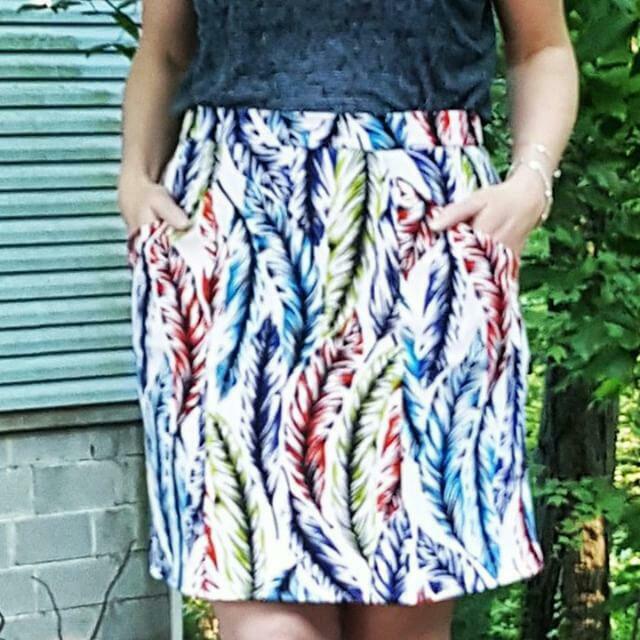 That's such a great skirt- it goes with so many things! I chuckled about your missing piece- when you find it, you can just make another top for your collection! Thanks for the tip about the ruler. I think I need one. Great outfit. Love the different back---definitely a styling point, not an error. And as the previous commentor said---when you find it...another top!